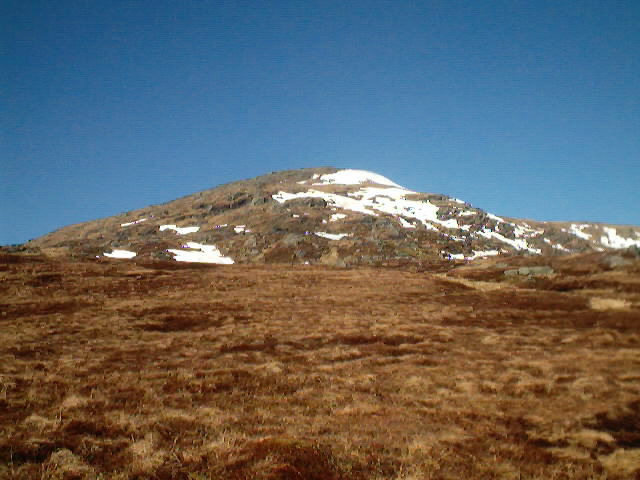 A short distance from Killin, Meall Ghaordaidh, or Ghaordie, rises, somewhat detached, between Glen Lochay and Glen Lyon and is normally 'bagged' as a single Munro either from Tullich or by a shorter and perhaps more picturesque route from Duncroisk. There is a small layby, which can accommodate only five or six cars, just beyond the bridge over the Allt Dhuinn Croisg past Duncroisk Farm in Glen Lochay from where this approach begins. Walk back a short distance, east, over the bridge, and pass through the gate on the left (north) side of the road. A wide track, heavily rutted by tractor tyres, forms the first part of the route onto the open hillside as it rises gently beside the burn to the ruins of some sheilings. A short way past the ruins is a fence alongside which the path leads northwest up a broad, sometimes boggy shoulder of grass and heather. A rusty iron pole on the north side of the fence marks where the path continues on an easy gradient to some outcrops of rock. As the route clears the rocks, the rounded summit comes into view for the first time and from here it is an easy stroll to the OS trig pillar which is set inside the low wall of a cairn and offers some shelter on a windy day. The return is a reversal of the inward track. Start/parking Small layby in Glen Lochay a short distance past Duncroisk Farm. GR: NN 526363. 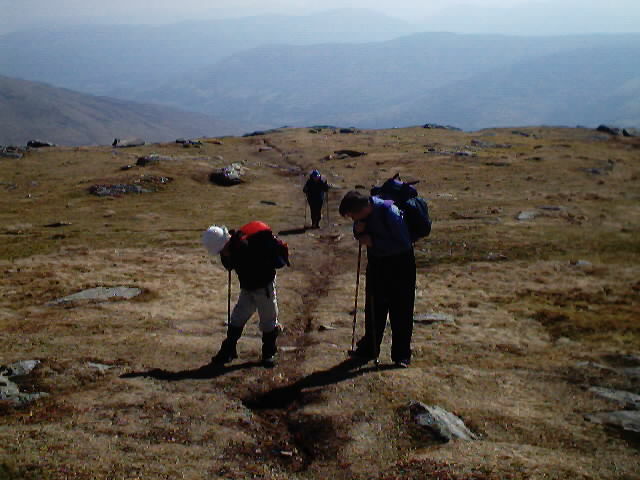 Grading Perhaps one of the easier Munros, ideal for fit adults and older children. Full weather and navigational equipment must be carried with dogs kept on a lead and under strict control at all times as the route passes through sheep grazing land.